Ask fellow campers about "Grand Texas" and nearby attractions. Stayed Dec 2017 thru April 2017. What a great place. Outstanding WiFi and 'good cable'. It's gonna get busy when they finish the water park and stuff across the street. Very friendly and responsive managers and owners. Close to interstate. Will def return in the fall for our winter in Texas. We camped at Grand Texas in a Motorhome. Flying J is 3/4 miles away but propane is way higher than at the rv resort. Get your propane here! Very nice park. The swimming pool is rather small. The patio is small and in a strange location: it does not match up to a motorhome door or a fifth wheel door. Site surface is a concrete pad and offers a patio. We camped at Grand Texas in a Motorhome. Walmart approximately 10 minutes away and Dennys 5 minutes away. 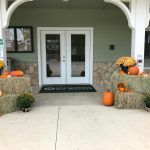 This is our 2nd stay, a one night stop on the way to south Texas for the winter. Easy access from Hwy 59 / I-69. This park is a good value based on the area it is in. Good satellite and over 100 cable tv channels. good Verizon service. Grass has filled in. Very nice dog park. Reservations would be suggested for a one night stop, as the park is almost sold out tonight. 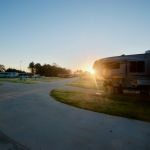 We camped at Grand Texas in a Motorhome. We liked almost everything about this park. I will like it even more when there is an exercise room, which I was told is coming. The staff was friendly. The pool and hot tub was nice. However the pool is a bit small and too deep for most children to stand up in. I found it kinda deep for me actually, but I'm only 5'1". Another drawback is that the rows are 30 sites long and there are no paths to walk between RVs to get to the pool and rec room. So I had to limp along 15 sites to the end of the row, then limp that far back again to the pool. A strange set up I thought. I know I'm not the only RVer with arthritis. We camped at Grand Texas in a Motorhome. This is a very new park with a few growing pains. Grass is very thin and ground gets very soft when wet. People cut site corners and are making mud problems. Not all facilities are completed yet, but new ownership is moving forward with some good plans. Hookups at the back-in sites are in very poor locations, but plans are to correct this. Small concrete patios are not convenient for most rigs positioning. Location is very good for us, as we visit family in the area every year. Lots of development of other recreational facilities near the park, so it likely will become a destination campground in coming years. If you want the lowest price back-in sites better bring long power cords, water hoses and sewer hoses. Pull through sites are more manageable for utilities. We camped at Grand Texas in a Motorhome. Very convenient to the nearby Flying J fuel stop. Park opened a few months ago, got a deal on a monthly rate for pull thru, cable was good, wi-fi worked well. Park was 3/4 empty our entire stay. level paved sites. Propane available. The cons..interstate and train noise, concrete patio does not line up with your door, sand and some grass between sites. Only amenities are laundry, 2.00 to wash 2.00 to dry, bathroom, pool table and television in office. laundry and bathrooms require code. Other amenities are to come in the future, good for an overnight stay but not long term yet. We camped at Grand Texas in a Travel Trailer. Great for a one night or several. Paved roads and sites. New park and they were still working to get all the grass in. 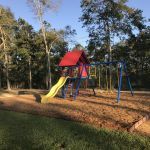 We make a one night stop in New Caney each year on our way south for the winter and it was nice to find a park at a reasonable price that did not have negative reviews. Our rig is 60' long and fit on the standard pull through. The premium sites look to be about 70-75 feet long. They told us that a new water park was being built across the street. 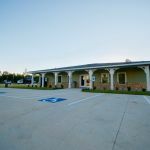 They have a good location with a Pilot and a Valero truck stop about 9/10 mile away. We camped at Grand Texas in a Motorhome. Pilot truck stop with a Denney's restaurant and a Valero truck stop at the intersection of Hwy 242 and Hwy 59. The Park is about 9/10ths of a mile west on Hwy 242 and on the left.. The initial map we looked at had the park in the wrong location. Stack em and pack em in! Very disappointed in the advertisement vs. actuality. This park was designed and is currently filling with long-termers. If this place ever got close to capacity, you will be parking on top of each other. There is no room between spots, especially if you have multiple slides. If you want to stay overnight, this is a decent stop, however pricey. The best place to be is in the 120s sites. The trees stop some of the highway noise but if you go to the back away from the highway, you get to hear the party and music that goes on all night. However, this is only after they finish the construction of the racetrack next door, they start early in the morning! So, we weren't impressed with the location. There's not much to offer in the area, but I will say that the staff is nice. All they talked about is what is being built, I guess we were too early. Oh well, we might have to stop by after they get finish building. After our stay, I did find other campgrounds closer to attractions and a lot less expensive with trees and amenities (and more space between spots). 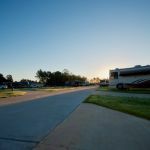 We camped at Grand Texas in a Fifth Wheel. Drive by before pulling in. You will commit when you pull in because there is not an easy turn around. I guess we were the 4th rig to stay at this new RV park. It was mentioned to us at the Flying J down the road. It has been raining in East TX for several days and what we thought was wet ground turned out to be deep east TX red gooey clay. I stepped out of the MH and sunk down 3" into the quicksand. We had to take off our sneakers and walk in the mud. Whoever designed this park had had experience with towables. The sewer inlet and water/pedestal were located towards the rear of the long pull-thru. The landing pad is in the wrong place for a MH with a toad to park. I'm sure when the grass is laid it'll be great. The 50 amp plug was defective and so was the site next to it. My 30 amp adapter was put into use. The rep on duty, Lance Martin, was very helpful and even brought us a wood pallet and carpet remnant for a landing pad. If you are pulling a toad, you should unhitch at the office if you want to utilize the pad. When they get their amenities and grass, it'll definitely be a great park. We would return. We camped at Grand Texas in a Motorhome. Are you affiliated with Grand Texas ?